There are many varieties of broths and stocks on the market, and the uses for them, it seems, are limited only by your imagination. So be bold. Experiment. By the way, you don't have to buy your stock or broth. If you've got extra time, take an afternoon, and make your own. No cook should be without a collection of broths and stocks. They save time and give you a head start on your cooking. There is a difference between broths and stocks. Technically, stocks use meat bones, while broths do not. There is no such thing as vegetable stock; if your base is made using just vegetables and no meat, it's a broth. But often in recipes and in common usage, the terms "broth" and "stock" are interchangeable. If a recipe calls for broth and you only have stock, go ahead and use it. For convenience, go ahead and use boxed stocks. They come in aseptic packaging that doesn't need refrigeration until the box is opened. Then the stock can be stored in the refrigerator for two weeks. If you want to store it longer than that, freeze the stock in ice cube trays, then package the cubes in tightly sealed freezer bags for up to a year. You can remove excess fat from stocks or broths by refrigerating the package before opening. Then, whether the stock is in a box or a can, the fat will be a solid on top of the broth. If you're a perfectionist, use a slotted spoon to pick up the fat and discard it, but any spoon will work to grab the solid fat. Use chicken, beef, or vegetable broth in place of water to cook rice. The rice will have a marvelous flavor, and many cooks say it is more tender than rice cooked with plain water. If you use salt or other seasonings when cooking your rice in water, cut back or eliminate the seasonings altogether because the broth or stock is already seasoned. Cook couscous and hydrate cracked wheat with broths or stocks. Again, this adds so much flavor and not too many calories. Stocks and broths can be used to reheat leftover stir-fries. Use a small amount over high heat, and add the leftover food; quickly and gently stir-fry until heated. You can saute with stocks or broths. Use the same amount of liquid as oil the recipe calls for. Watch the food carefully, because the stock evaporates while the oil doesn't, so the food may burn or overcook. Baste chicken, beef, or pork while it's roasting in the oven with broths or stocks to add flavor and to keep the meat moist. Moisten leftover casseroles with a few spoonfuls of broth and stock before reheating in the oven, in the microwave, or on the stovetop. 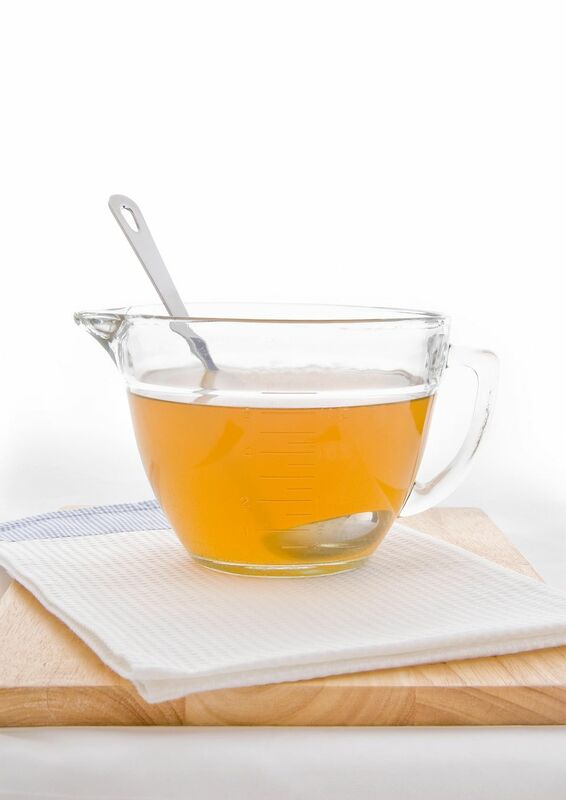 Each 14-ounce can of broth or stock contains 1 3/4 cups of liquid. Each 32-ounce box contains 4 cups of liquid. Bouillon cubes can be used to make chicken, beef, or vegetable broth. But they are high in sodium, and sometimes leave a powdery aftertaste. Some home economists like the cubes better than canned stocks. Use your own judgment and taste buds.